16.01.2019, Austrian Research Promotion Agency FFG. Michalis Tzatzanis (FFG) provided an introduction to the concept of open science, outlining its definition as “the practice of science in such a way that others can collaborate and contribute, where research data, lab notes and other research processes are freely available, under terms that enable reuse, redistribution and reproduction of the research and its underlying data and methods” (FOSTER project). Importantly it also includes issues such as new metrics, skills and rewards. Annette Björnsson, Deputy Head of the Unit on Open Science, from the Commission’s Directorate General for Research and Innovation (DG RTD) provided an overview of open science in a European context. Frank Miedema Dean and vice-chairman of the board of UMC Utrecht Co-founder of Science in Transition, provided a “frank” discussion of the current scientific systems and the challenges it poses for open science. In 2016 the Dutch Health Council asked for medical research to be more relevant to patients. 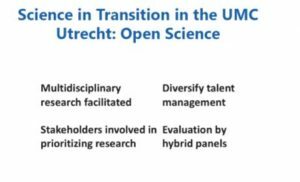 UMC Utrecht implemented an open science approach. In the panel discussion Annette Björnsson provided some further insights into the future of open science in Horizon Europe where it will be the modus operandi. Frank Miedma pointed out that a lot of his colleagues (especially women) arefrustrated with the way the scientific system works. There is a need to go back to what science is for: the good life. Katharina Rieck from the FWF briefly described the activities of OANA in Austria, a bottom up network, including inter alia training activities.